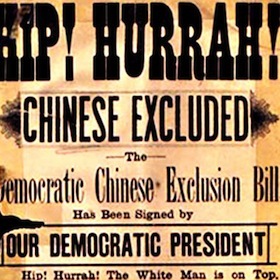 An evening of stories and discussion about the impact of the 1882 Chinese Exclusion Act (which wasn’t rescinded until 1943!) on the Chinese American community in San Francisco. This infamous legacy was both subtly woven into community cultural life, and overtly demarcated social and geographical boundaries. Chinese Whispers, a research and storytelling project about the Chinese who helped build the American West, will present excerpted stories from the Bay Area which reveal the deep impact of the Exclusion Act on generations of Chinese American families, and a community story contributor will talk about memories of a growing up in a San Francisco Chinatown that was still essentially socially segregated from the rest of the City. This overlooked history is also very relevant to the ongoing immigration debate. With the Chinese Historical Society of America, Angel Island Immigration Station Foundation, filmmaker Felicia Lowe, and more. This entry was posted in Events, Uncategorized. Bookmark the permalink. Follow any comments here with the RSS feed for this post. Post a comment or leave a trackback: Trackback URL.